WEC2013 delegates will be provided 2 way airport transfers on 12 and 13 November 2013. 2 way hotel transfers will also be provided between official hotels and conference hotel from 13 to 14 November 2013. In regards to the technical tours, delegates will be picked up from official hotels on 14 November morning and transferred to the Pier. Delegates are provided 2 way ferry tickets to Bohol, returning to Cebu on the same day late evening. Taxi cabs are one of the primary transportation modes in Cebu, along with jeepneys, V-hires (airconditioned vans) and buses. White taxis (City taxis): Upon your arrival at domestic or international arrival areas: you have to go up a flight of stairs towards the domestic departure area entrance where they queue for customers. Yellow Taxi (Airport taxis) - They have a counter just outside the domestic and international arrival area.Yellow taxis may be slightly more expensive but more reliable as you will get a receipt with details of taxi and destination. You can find them basically anywhere in Cebu. In and around Cebu City, there are plenty of taxis and it's only a few US$ to take you to the shopping mall or favourite restaurant. Note: Taxis are required by law to use the meter. It is advisable to always remind the driver to switch on the meter. The Land Transportation Regulatory Board (LTFRB) regulates the taxi business. To make a report, you have to remember either the big bold body taxi number or plate number. Whether you are taking taxis or jeepneys, it is always advisable to take care of your wallets and valuables as you would not want your trip to be spoiled due to carelessness. if you need assistance, please email to hospitality@wec2013philippines.com. The Cebu Department of Tourism will provide the necessary assistance. Most convenient transportation in and around Cebu city. Always remind the driver to use the meter. Common mode of transport for the locals. You'll get to experience one of these ferries on your technical tour to Bohol. Economical inter-city travelling by bus. Buses depart either from the Cebu North Station for northbound or Cebu South Station for southbound. A cheap way to move around if you are in a group. Rental rates including driver and gasoline starts from P3000 (US$70) a day (8 hours). 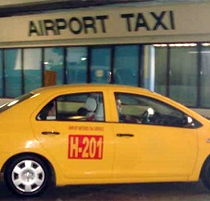 Taxis may be the best way to get around for travellers who do not rent a car upon arrival at the airport. At the airport, you will find white taxis and yellow taxis. White taxis are city taxis and the flag meter starts at P40. Yellow taxis are airport taxis and charge double the rate because they are not allowed to pick passengers from the city. Taxis are required by law to use the meter. The average taxi fare (white taxi) from the airport to Radisson Blu is around P250 to P350 depending on the traffic. Tipping can be around P20 to P50 depending on the service rendered. The main bus lines servicing the Cebu area are Ceres Bus Liner (261 5008), CBL Liner (232 1850),ABC Liner (253 1668) and Rough Riders (233 5238). The Cebu South bus station is a short taxi ride from downtown (around P30). If you're after a public bus north, there is the Cebu North bus station, servicing several bus lines. There are also air-con vans departing from the White Gold Terminal (232 7501; Pier 4, Reclamation Area). They have no schedules, but leave when the van is half to three-quarters full, so if you're the first seated, you may have to wait. Air-conditioned and with fewer passengers, these are a faster, cushier way to get around. Rates are up to 30% higher than the bus. Cebu City's vast, multi-piered port throngs with boats travelling around the Philippines and internationally. The bigger passenger- ferry lines such as SuperCat and OceanJet run large, fast ferries to and from Cebu City every day of the year except Good Friday and New Year's Day. Most companies offer discounts to students (15%), disabled travellers (20%), senior citizens (20%) and minors (12 years and under; 50%). Cebu taxi drivers do use the taxi meters and do not give you as much of a problem than Manila taxi drivers. I lived in Cebu for a bit and only encountered a handful of taxis who asked for more than what the meter says. Regarding the taxis, they are generally honest, except for some bad ones. But they are easy to catch. Those taxis that queue in the taxi lines: airport, malls, hospitals, commercial establishments, those are generally good.